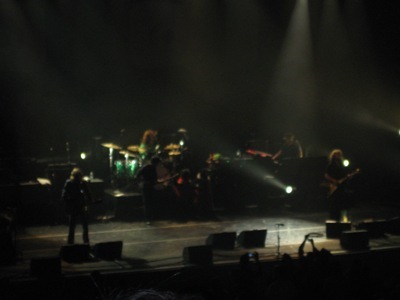 Here is the second half of guest blogger (and my occasional +1 at shows) Brent Stecker’s review of our weekend that included an amazing My Morning Jacket show and a solid effort by Cold War Kids the next night. You can read the first part of his review (which covers the MMJ show) by clicking here. Post show, T-$ (ed. note: in case you didn’t read part 1, T-money is Brent’s oddball nickname for me) took me to Beth’s, a “Seattle institution,” where I enjoyed some fantastic breakfast food and indulged in the $6 Milkshake (ingredients: chocolate, peanut butter, brownies, and the diabeetus). Oh yeah, I got my peanut-butter pudding surprise all right. With the help of Dollar-Dollar’s friend Brian, we came up with some good ones, including “That’s how we found out kangaroos make for lousy housepets.” Just so you know, the joke will never get old. Earlier this week my buddy Brent Stecker and I trekked over the hill (that’s Eastern Washington lingo for driving over the mountain passes to go to Seattle) to catch a few shows. Sunday night we saw My Morning Jacket at McCaw Hall (one word: awesome) and Monday we caught the Cold War Kids twice, once at their Easy Street Records in-store set and later that night at the Showbox. I’d love to tell you all about both shows, but since Brent did such a good job summing up our weekend adventure on his MySpace blog I decided it would be better to let him recount our musical escapades. Also, Brent recently started a promising blog about guitars and guitarists called Tiny Strings (the link to the blog will be coming soon, I promise), so I figured this post would act as his indoctrination into the blogosphere. So here is guest blogger Brent Stecker’s review of the first of two excellent shows that went down recently, taken from his MySpace blog (emphasis added).